The Pitch: I was listening to Sting's 'Demolition Man' and patting myself on the back for getting some Demolition Site sets about $60 CAD off retail when I thought others might be interested in my thoughts on Sting and Lego. Seeing how past construction-type sets fared seemed like a good point of comparison, and I had a suitable soundtrack. Unfortunately, the lyrics are a bit foreboding considering I am advocating for Demolition sets, but if nothing else they forced me to be a bit conservative in my future estimates. The Demolition Site (60076) looks a little 'kiddy' to me, but it isn't all that different from Construction Site (7633) and that has done pretty well on the aftermarket. The crane could be a little bigger and the demolition building could be fleshed out a little, but overall it is a great set to get cool yellow construction vehicles at not a bad price. With the last flasgship construction set 7633 hitting a high of $243 USD, it seems reasonable that 60076 should do well despite a smaller piece count and not being quite as eye-pleasing (at least to me) of its predecessor. Even a conservative projection of perhaps $170-180 USD makes buying Demolition Site on sale a fairly low risk, solid investment. While it will likely never be the best gainer in your portfolio, there is nothing wrong with solid, low risk options, too. Availability beyond the spring might be online only for a lot of Canadians, as Costco had them this holiday season (and likely won't next) as well as Canadian Tire. Now that Wal-Mart Canada has started clearancing these out (my last three were at $50 CAD, which tickled me pink) it seems unlikely they will get a massive restock of the Demolition line, leaving TRU. Availability in your market might be different, but this is a set I wouldn't pass over with a decent sale. You should still be able to find the Excavator set (60075) at retail even though it is listed as 'Sold Out' with a discount on Shop at Home, which is generally a solid precursor to the cherished 'retired product' tag. It compares well with the 4203 Excavator & Truck (part of the Mining subtheme from 2012) which is trending up at the moment but has still had a rather disappointing post-EOL performance. This is likely due to the Mine subtheme having a bit of a longer shelf life relative to some other City subthemes as well as the fact that the Demolition subtheme has a very, very similar excavator set that essentially replaced the earlier version. So far I'm not selling you much on this, but there are a couple of factors that might indicate this set will do a little better than its predecessor. First, unlike the rest of the Demolition subtheme, this set appears to be going/gone at least several months earlier (possibly around a year, if it follows the Arctic pattern) than the other sets in the theme. If end users went gaga over the Arctic Supply Plane, which isn't all that enticing, I have reason to believe the shorter lifespan will lead to an overall better/faster performance that 4203. Secondly, 4203 is starting to grow (up nearly 15% in the latest Brickfolio update), so I believe a lot of inventory that might be sold at or close to MSRP has been absorbed by end users (i.e. Timmy or Tanya – want to give both genders a chance to buy sets at secondary market prices). I jumped at 35% off, which seemed like a big enough discount for a short-run set that comes from a reliable theme. I'm sure there are kids (who grow into adults) out there who don't like bulldozers, but I don't know any – and I'm not sure I want to. Bulldozers populate kids books, sandboxes and grubby hands; obviously The Lego Group has done enough market research to realize kids would also like them in Lego form (BP has 18 entries under 'dozer' so it has some history). The 2007 Technic Bulldozer is particularly awe inspiring, but for sake of comparison, the current set most closely matches the 7685 Dozer from 2009. It peaked at just under $90 ($89.60) which is fantastic for a $39.99 set that (like all City sets) can be pretty easy to get on sale during its shelf life. Given that Lego investing is quite a bit different than '09, a doubling of MSRP still seems possible. Of course, given the popularity of the subject matter, it seems almost certain more will be made that will be very similar, but there should be a window of a year or two to move the current bulldozer with limited risk. Even with the 2015 dozer hurting the sale prices of 7685, it is still trading at around double MSRP, which tells me there will probably always be some demand for older dozers even if a remake comes a little earlier than investors would like. Given the state of the Canadian dollar, I think I would start buying at a 30% discount or better. The Service Truck 60073 is my pick for being an EOL surprise. It screams 'I am the second coming of the Logging Truck!' to me. I frankly don't know how anyone can create a realistic construction/demolition site without a porta-potty. I can't find a previous set that seems to capture the play value and display value as well as this little guy in previous construction subthemes, and when I look it it I just get a great vibe. I won't be surprised if this has the overall best ROI% two years from now. I stocked up on a few at 33% off and will continue to add them when on sale. Yellow construction vehicles at minifigure scale have been popular enough to make appearances regularly, so one must always be ready for a rehash of the theme, but they have been spaced out roughly 3-6 years. If the remainder of the Demolition sets listen to the wants of investors and retire themselves in Q4 this fall, there should hypothetically be at least a couple years to absorb demand. Of course, investors must take precautions – buying more than you think you can sell in the next couple of years might backfire. When I invest in City sets I do so knowing I have a responsibility to scout rumors of upcoming sets and to act accordingly. If you are a long term holder and/or don't have the time to take 'hits' of Brickpicker weekly/daily/hourly/minute-ly, City might be more trouble than its worth. That, and the best discounts I tend to get on City sets are in brick & mortar locations, so 'prospecting' is also generally needed and might not be possible for you in your location or life situation. For those that are still interested, I think these four sets are a worthy add to your portfolio and will diversify it nicely. In current mass hoarding of everything times, a 2 year (or more) life shelf life will likely kill these sets as an investment opportunity. Only the retired (in Europe) 60075 seems to be a safe bet as it went quickly an quietly. Saying that, it can still be found in many shops. Buying in at less than 40% off is, in my opinion, quite a risky investment for the other sets. I do not know how these will fare as investments are concerned however I will say each one of these sets do offer a lot of play and to a degree display value as part of a builder's large cityscape. Tearing down, blowing up, and other synonyms for destruction, is just fun. Once more these designs can double for sites under construction of course. Out of them all the Bulldozer was the most striking in being what it should be no more or less wrapped up in a tidy box. Not many 'play features' with the port-a-potty truck but still a fun and funny build. Oh right, and just because. Lego spies obviously read the blog as these sets are on sale at US SAH! 20% off is an awkward number - tempting but not a no brainer. It would suggest they are all goign to retire sooner rather than later, though. I have such trouble finding Lego at a nice clearance price. That stated, I was able to get set #60073 (Service Truck) for 50% off. That was the only one that I ever found on sale. I wrote this in part because some folks in the Daily Deal thread were posting seeing some sets from this theme on clearance and wondering if they were any good. 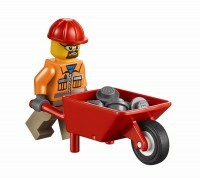 I just wanted to highlight that construction-type minifig scale sets have proven good to great in terms of popularity in the past and I think it indicates the potential of the theme. If the current S&H sale clears out Demolition Site for good...then 20-30% off probably looks pretty good (as opposed to Demolition Site being at retail another 8-9 months). Yes...speculative, yes, the current sale is no guarantee it won't come back (it was on sale in Nov-Dec from S&H) but interesting enough for me to keep a very close eye on the sets currently on sale. Chaos is in full effect. Mine - Demolition - Volcano theme would seem to be the pattern.